.Less - based on the ruby Less library - extends CSS with variables, mixins, operations and nested rules. Additionally, you can use it to minimize your CSS files, decreasing the time and bandwidth necessary to download the files by the client. Using .Less is pretty simple, yet powerful. I'll show you what you can do with it after I've shown you how to acquire it and how to configure your application to use it. You do that by hitting the large Download button on the .Less home page. The downloads page currently lists two files: dotless-v1.0.0.5 that contains the actual library and t4css-v1.0.0.5 that contains the T4 template. Download the library and unzip it to a folder on your hard drive such as D:\Tools\DotLess. In your web project (Web Forms and ASP.NET MVC both work fine) add a reference to the dotless.Core assembly located in the folder you created in the previous step. To hook up files with the .less extension to the .Less Library, you need to add an httpHandler element to either the system.web/httpHandlers node (for versions of IIS prior to 7.0) or to the system.webserver/handlers section. Instead of just the .less extension you can also use a double extension of .less.css. I actually prefer that over the .less extension as the file is now more or less treated as a CSS file, giving you IntelliSense and color coding. The file is also treated as content and is included in a published version of your site without any additional steps. I'll stick to the .less extension in the remainder of this article though. minifyCss Whether or not to remove all irrelevant white space from the CSS file when generated. cache Determines whether generated files can be cached, or are regenerated on every request. source This attribute expects a qualified type name of the type that implements the ILessSource interface. Shipping types are FileSource (the default), AspServerPathSource (the default when used in a web application), StringSource (although it doesn't seem to be used at the moment) and VirtualPathSource (which is used in advanced scenarios where there's no direct mapping between files on disk and virtual requests. For more information about the VirtualPathSource option, check out the article ".Less now supports files from the VirtualPathProvider!)" With the configuration done, the fifth and final step is actually using .Less, discussed next. .Less supports a limited but powerful set of features. Using it is so simple that the documentation is only a single page: http://www.dotlesscss.org/docs.aspx. You're advised to check out the documentation and try the examples for yourself to get a better feel of the capabilities of .Less. To give you an idea of how it works, I am showing you a few of the concepts here. Notice how this is a normal CSS reference with the extension changed to .less. When this file is requested by the browser, the .Less HTTP Handler kicks in, processes the .less file and returns plain CSS that the browser understands. Even if I made no other changes to my CSS file at this point, I would still benefit from .Less, as the CSS is now minimized when requested the first time and then cached. This reduces my file from somewhere over 7KB to around 6KB. Not a huge difference, but that's because my file doesn't contain a lot of overhead such as comments. I've seen other files where the actual compression is much more substantial. Next it's time to implement some of the .Less features. The easiest to use and understand are variables. When the .less file is requested, the variables are parsed and replaced and the final CSS that is sent to the browser is identical to the original example. Notice how the width of the border is overridden, but the color is still taken from the defaultColor parameter of the mixin. Exactly how you'd have written it yourself using normal CSS rules. What I really like about this is how everything that belongs together stays together. When you now rename #Footer to #footer, everything keeps working and there's no need to use search and replace to fix each occurrence of #Footer. This can be a real time-safer, especially in more complex layouts or larger CSS files. Be sure to check out the documentation for a description of all features and more information on how scope works in .Less, how comments are processed and how you can import external files (using @import like in normal CSS files). Drop the T4 template in a folder. For each .less file it finds in that folder, it will generate a CSS file for you, so you typically drop the T4 template in a folder such as Css, Styles or Content. The contents of the Core.css are now based on those of the Core.less file, taking all .Less rules you've seen before into account. This reference tries to find the DLL in the project folder itself. If you have it located elsewhere, you can use a fixed folder location (e.g. D:\Tools\DotLess\dotless.core.dll) or use the Visual Studio folder expansion macros such as $(SolutionDir) and $(ProjectDir) to refer to the Less dll relative to your Visual Studio solution or project. The downside of this template is that every time you change your CSS files, you need to save your T4 template as well, or the changes won't be processed. For a work around, check out the section "The T4 file automatically runs whenever you build" in the article The MVC T4 template is now up on CodePlex, and it does change your code a bit or take a look at Chirpy that handles this and more for you automatically. This code creates a new DotlessConfiguration class with its MinifyOutput and CacheEnabled properties both set to false by default. If you want minimize the generated CSS, simply set its MinifyOutput property to true. m When set, minifies the output. w When set, keeps the command line compiler open and puts a watch on the source file. Every time the source file is changed on disk, the output is regenerated. This is useful when you're designing your CSS file outside Visual Studio (in, say Dreamweaver or Expression Web) and want to have an updated version of the CSS file at all times so you can display it in your browser for example. w Displays the help text. The Command Line Compiler is also pretty easy to integrate in any automated build system you may be using. While it's CSS syntax looks a bit different at first, it's very easy to get used to .Less. In a way, it feels much more natural than the original CSS syntax, especially when using variables and nested rules. Although I haven't done many projects with .Less yet, it looks like it's going to find a place in my web development toolkit. The advantages, both at development time when writing CSS and at run-time when serving the minified files are obvious, and I have yet to run into a disadvantage (other than the short learning curve of learning the .Less syntax). The many different options to use .Less (HTTP Handler, T4 templates, Command Line Compiler or programmatically) should make it possible to use .Less anywhere you need it. If you want to learn more or start using .Less, be sure to check out its official web site: dotlesscss.org. Thanks for the .Less article and confirmation about this cool tool for CSS. Jeff Atwood of Coding Horror also did a write up recently http://www.codinghorror.com/blog/2010/04/whats-wrong-with-css.html that included .Less. Another tool to learn and add to the tool box. Thanks for introducing me to .Less. Useful article and well presented. Just a quick question, though: when you talk about toolbox, is there some kind of system you have in place? I'd really love to see how experts like yourself organise themself. If you get chance, why not do an article on that? When I say Toolbox, I am not referring to a very concrete thing. However, once I know something exists, it's easier to reuse it in projects that require it. Tools like .Less with a high potential often end up in my "default web site"; e.g. a project type similar to the projects you see when you choose File | New Web Site or File | New Project. Creating your own is as simple as using the Export Template item on the File menu. Also, I tend to store a lot of these small projects in Source Control (TFS). That way, weeks from now, when half of what I learned has already been forgotten, it's easy to get a latest version from source control, read my notes from the "Stuff I learned.txt" document I keep track off (and my own articles on this web site ;-) ) and implement that technology or concept in a new project. Article is damn good. I downloaded the .less zip file from link you posted. It is 3.4MB in size. There are too many files and it is confusing me to get the right files you are talking about. I wanna use T4Template, what exact files are required for this. Too many files? The latest release (1.2.1) available from the .Less site has two downloads: the core (which includes the dotless.core assembly, 166KB) and the T4 package (70KB). But I downloaded the correct files now..
again I am not getting those files you have shown in Styles folder, Can you please mail me at my email id, that you get with this message, the latest version. Those files come from the T4CSS template, also available from the main Downloads page as a separate download. I get only dotless.core.dll in the dotless-v1.2.1.0 download. And only T4CSS.tt file in t4css-v1.2.1.0 download. 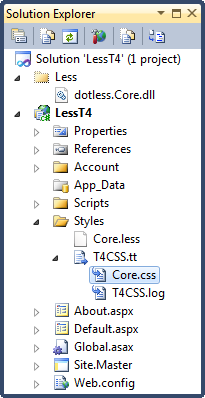 but I do not get Core.less and not the Core.css and T4CSS.log under T4CSS.tt file. That all makes perfect sense to me. The .less file is *your* file; i.e the Less file you want to transform using the T4 template. The CSS and Log file are then generated by the T4 template everytime you change the T4 file or run the "Custom Tool" command on the T4 template. You might want to actually read this article to see how this all works, or check out the Less site for more information. this time I added .less file to my project. I am using httphandler method, and when I use variables then they are underlined with green line. why that is so? I am using .less.css in web.config and system.web element. yes it is working at run time, but did not you get same warning? Thanks a lot for writing an article like this. It really helped me out to start working on dotLESS. It helped me a solve a lot of hiccups.